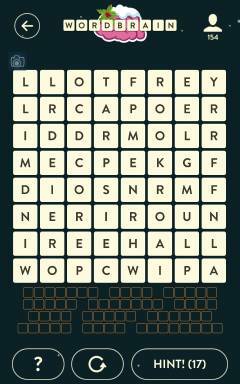 Wordbrain Unicorn Level 9 Answers and Solutions. All the same words, but the puzzle layout is different. I can’t find the correct combination. Cannot get it. The picture on here is different from the one we are trying to solve. The word WINDMILL is on the left side on this picture here and the one we are trying to solve has WHISPER and FERRY on the left hand side. I can’t get it either. WINDMILL is on the left handed side on the picture and on the one we are trying to solve has WHISPER and FERRY on the left.